‘Living hoarding’ has been installed at Pentland Homes’ Scholars Village development in Folkestone. 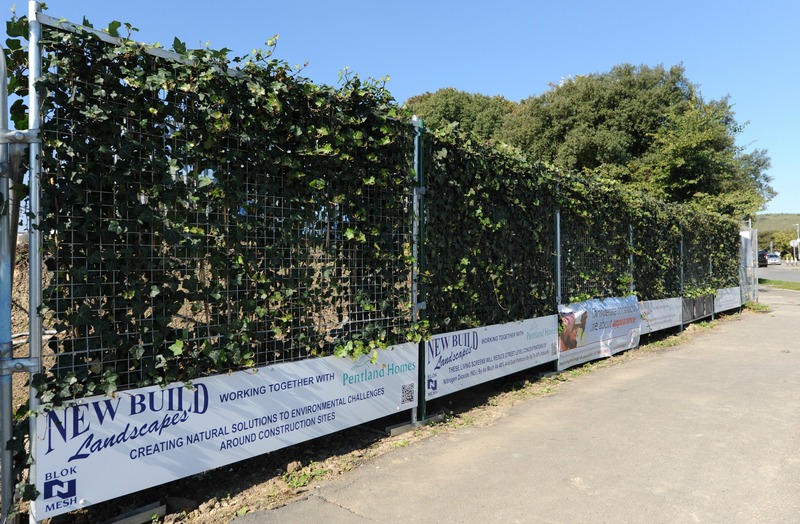 17 metres of ivy screens were installed at the front of the site by Dover-based company, New Build Landscapes, with branded signage including a QR code taking viewers to the Urban Greening website for more information on the benefits of the installation. ‘Living hoarding’ suppresses dust particles to improve air quality, reduce temperature and carbon dioxide levels. Studies suggest that 13 metres of ivy screens can equal the particle matter collection of an urban tree. The screens also increase biodiversity such as insects and butterflies, and discourage vandalism – which is great news for residents living on and around the development. The living hoarding also absorbs ambient noise much better than other types of fencing, resulting in noise reduction on construction sites. As Pentland Homes and New Build Landscape made this living hoarding portable, the screens can be moved around the site to where it is most needed.